One in five Americans are expected to develop skin cancer over the course of their lifetime, making melanoma the most common type of skin cancer in the U.S. That’s why 18|8 Fine Men’s Salons has partnered with the Eyes on Cancer Foundation to learn more about prevention and early detection of skin cancer. 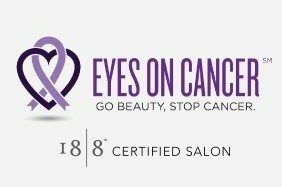 Eyes on Cancer is a national nonprofit foundation whose mission is to advance the prevention and awareness of cancer through education in the beauty industry, beginning with melanoma. The organization provides training and certification for beauty professionals to identify any suspicious skin abnormalities on the scalp, neck or head of clients. As a men’s salon, we believe it is important to join in the fight against skin cancer and to work towards attaining certification of all of our 18|8 salons. To date, 20 of our 18|8 nationwide salons have received their certification to help identify the early signs of melanoma. This partnership signifies our brand’s dedication to our guests. The introduction of this new approach to the early detection of skin cancer offers clients an invaluable – and potentially life-saving – service beyond traditional salon grooming services. To learn more about the Eyes on Cancer foundation, to take the certification course or to donate, visit www.eyesoncancer.org.